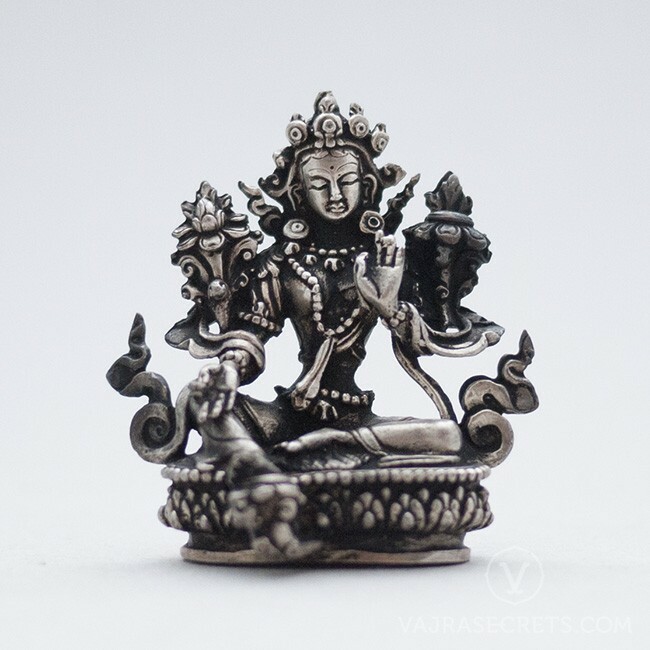 A miniature sterling silver statue of Green Tara, renowned for her swiftness in aiding those who sincerely invoke her in prayer. Exquisitely hand-carved by master craftsmen with full iconographic detail according to traditional scriptural sources, this is the perfect addition to a small shrine at home or in the workplace. A miniature sterling silver statue of Green Tara, one of the most widely revered saviour-goddesses within the Tibetan Buddhist pantheon. Exquisitely hand-carved by master craftsmen with full iconographic detail according to traditional scriptural sources, this is the perfect addition to any altar or shrine, at home or in the workplace.